A driving game from Sega, housed in a Naomi Universal cabinet. You take on the role of a taxi driver and must make money from fares and tips. It's a race against the clock as you pick up passengers and white-knuckle it through busy streets and back alleys to their various destinations. To keep that meter collecting cash, you've gotta take the fastest route possible, even if it means bending the traffic laws -- just a little. Drive the wrong way down a one-way street, catch air as you sail over rooftops, swerve between oncoming traffic, or plough through a pavement cafe. But beware -- the city is full of obstacles that are guaranteed to slow you down. And time is money! So get a grip on the wheel, sharpen your senses, and don't lose your cool. Like Harley Davidson and the L.A. Riders, game play takes place in a virtual city, this one modeled after San Francisco. Players pick up one of over two hundred-fifty passengers located throughout the city and as quickly as possible, deliver them to their destination. •	Gear Stick is temperamental •	All other aspects of Machine are good. •	Buyer Pays Freight or Pick up from shop no delivery. 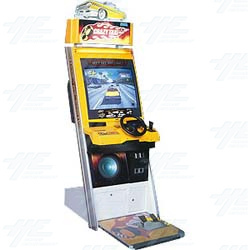 A driving game from Sega, housed in a Naomi Universal cabinet. You take on the role of a taxi driver and must make money from fares and tips. It's a race against the clock as you pick up passengers and white-knuckle it through busy streets and back alleys to their various destinations. To keep that meter collecting cash, you've gotta take the fastest route possible, even if it means bending the traffic laws -- just a little. Drive the wrong way down a one-way street, catch air as you sail over rooftops, swerve between oncoming traffic, or plough through a pavement cafe. But beware -- the city is full of obstacles that are guaranteed to slow you down. And time is money! So get a grip on the wheel, sharpen your senses, and don't lose your cool. Like Harley Davidson and the L.A. Riders, game play takes place in a virtual city, this one modeled after San Francisco. Players pick up one of over two hundred-fifty passengers located throughout the city and as quickly as possible, deliver them to their destination. •	All other aspects of Machine are good. •	Buyer Pays Freight or Pick up from shop no delivery.